SAUCE Believe it or not, I’ve sat through culinary seminars on regional BBQ flavors. Still, I get confused on the lines of demarcation between mustard and tomato, smoky and hot. Modern day marketing has diluted traditional regions of flavor. I even tried to find a clever info-graphic that would lend insight. No luck. So in the spirit of “necessity is the mother of invention” I made my own. Most historians agree that “Southern BBQ” originated in the Carolinas. There sauce was made with vinegar, ground black pepper, and hot chili pepper flakes. It was not sweet. The vinegar makes it thin and sharp. It penetrates the meat and cuts the fats in your mouth. Now while BBQ may have originated in the Carolinas, it quickly spread through the territories. As it traveled local pit masters began adding their own flavor. The more you study, the more fractured and local the story. I’ll boil it down to these two simple traits, sweet and savory. 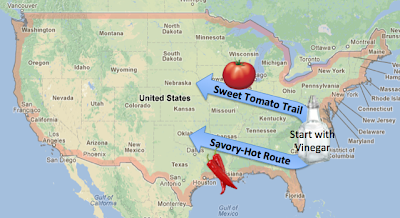 The “northern route” adds sugar and tomatoes; attacking the sharp tones of vinegar. In many recipes the sugar is replaced with molasses. In either case, the result is sweet and red. The “southern route” embraces the vinegar base and simply adds flavor. Depending on where you land, the flavor is more peppery-heat or more savory flavors. In addition to sweet and savory there’s a third element I’ll call smoke – or smokey. Smokey tones have been found in both sweet and savory, but I’ll put a pin in the map and call this Memphis style. Finally, for those of you who are asking, Mustard is a South-Carolina specialty. I’ve let to find a good explanation for why it came to be. I’m just glad it did. The whole piece is definitely worth a read. Man, now I'm hungry.